Discover the comfort of rooms and spaces surrounded by quality and great service in Bogotá at a price that suits your needs. The privileged location of Hotel Vilar América in the area of Chapinero, a few steps away from the best restaurants in the city located in Zona G and beautiful traditional neighborhoods such as Quinta Camacho, will be the ideal and central place for your business trip or tourism in Bogotá. A family hotel with a history of more than 35 years where you will find 76 comfortable and renovated rooms in the heart of Bogota's financial zone. Some rooms are designed for those looking for a long and comfortable stay in the city. You will also have at your disposal our 7 rooms for the realization of social or business events with a maximum capacity of 80 people, two restaurants and a catering service of the highest level. Our great trajectory makes us the best option in the Chapinero sector for business or pleasure trips, at a price that suits your needs. Know everything we bring to you. Find here our offer of rooms with an excellent quality price ratio, price and a magnificent location for your stay in Bogota. Enjoy exquisite dining experiences and extremely pleasant environments that merge perfectly with the warm service of our restaurants. In Hotel Vilar América you will find a privileged location in the financial center of Bogotá for the realization of business events, courses, conferences and marriages among others. We want to become an essential part of your romantic celebration, family or friends, offering plans and promotions in our hotel, along with a wonderful service. Ready to live the best experiences and service at great rates? The awards and distinctions are the best proof that our quality service and hospitality to all travelers like you, are constant and encourage us to work more to improve. We are happy to receive these distinctions over 35 years of experience. 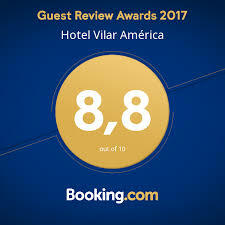 Hotel Vilar América as a tourism services company, is aware and committed in reducing the negative impacts within the industry, concerning environmental, socio-cultural and economic issues. For this purpose, it has developed programs for the efficient use of natural resources, the reduction of waste, and use of pollutants, the promotion of Colombian cultural heritage, support to local communities, and makes great efforts in the prevention of sexual exploitation of minors. The Hotel strives to raise awareness among its staff and guests, it enforces legislation compliance, and respect for the rights of its employees, suppliers, customers and guests, within a framework for sustainable development. Hotel Vilar América was one of the first seven hotels to be certified in Sustainability. It was awarded with the Colombian Environmental Seal, and recently in 2015, it obtained the certification at The Code. Vibrate with the excellent plans Bogota has for you. By day or by night, this city never stops moving. After about 6 years of performing in Colombia for a charity concert in Barichara, Damien Rice returns to Colombia to the Jorge Eliecer Gaitán theater. On December 31 at the Cafam Theater, the elegance of classical and European music is mixed with the joy of our typical Colombian music. In how many magazines, books and visits have you heard that the key to conquering a person is to be authentic and to get out of the routine?. It may be easier to say it than to apply it, since couples often feel comfortable and use to do plans such as eating out, going to the movies or simply staying at home. If you live in Bogotá or you will stay here some days and want to find plans for you and your partner, this article is for you. Read more about them here. This is how our guests have reviewed us! Located in the center of the financial district of Bogotá, a few steps from the main center of international business offices and next to Zona G, the exclusive gastronomic district of the city. We are waiting for you to serve you from the heart. © COPYRIGHT 2019 Hotel Vilar América, ALL RIGHTS RESERVED. BOGOTÁ - COLOMBIA.